Are you dreaming of fine dinner or even romantic dinner at your lovely house? 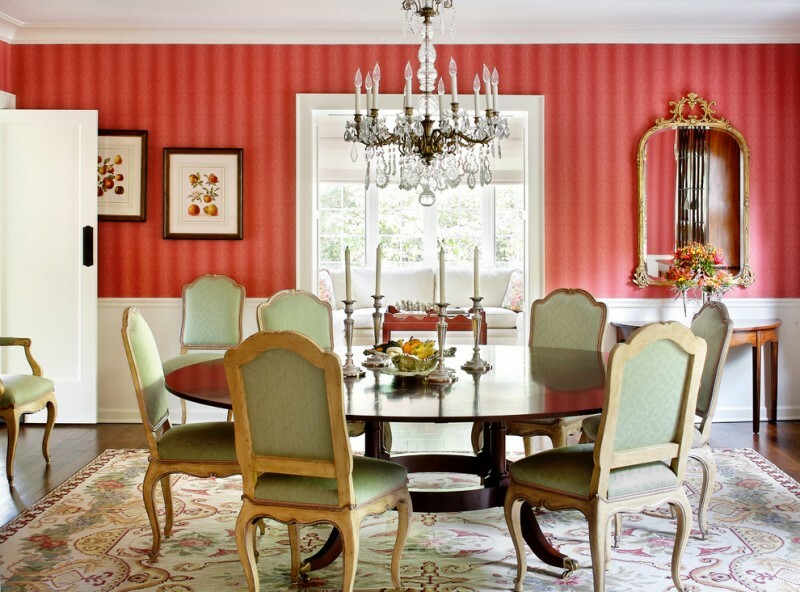 You can make your dream comes true just by adding French provincial dining set to your dining room. Even, it can be a central of your French way of life which probably expresses why this dining set is such delicate pieces of furniture. They will be the center piece or focal point of room where they seem to be so distinctive and unique. Different to other common dining sets, this kind of dining furniture set is sufficient to accommodate huge numbers of plates for a big family. They’re also beautifully designed in perfect shape, solid texture, and luxurious model. 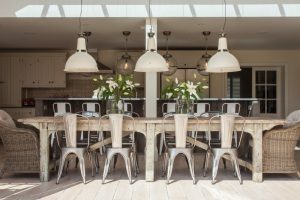 Well, to encourage you in confidently choosing the best products of French dining furniture set, here they are tens of most stylish and up-to-date French dining set ideas we recommend to you. This is called a French dining set with harbor point style. They combine farmhouse and beach styles as one. The result is so satisfying; both look so gorgeous for a country/ farmhouse feast. It’s good idea for a stylish dining furniture set with little bit crafted French style details. 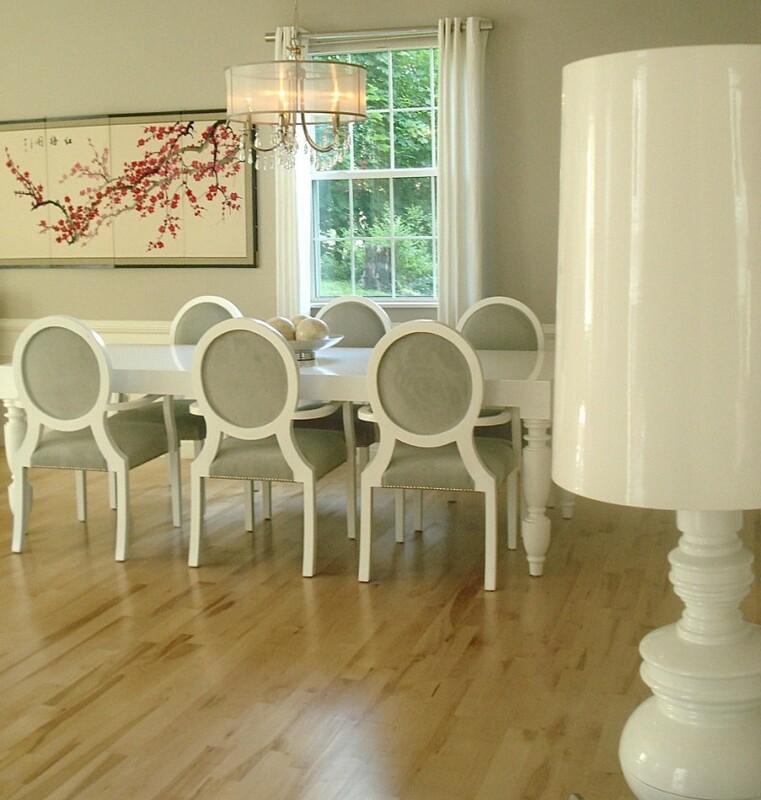 Stylish, elegant, and simple French dining set – a matched furnishings for chic dining room. It prefers to choose soft palettes like white for furniture and earthy brown for rug to other palettes. This color choice gives you brighter and cleaner look. Yes, it’s also little bit shabby but cool to create a dramatic visual effect. 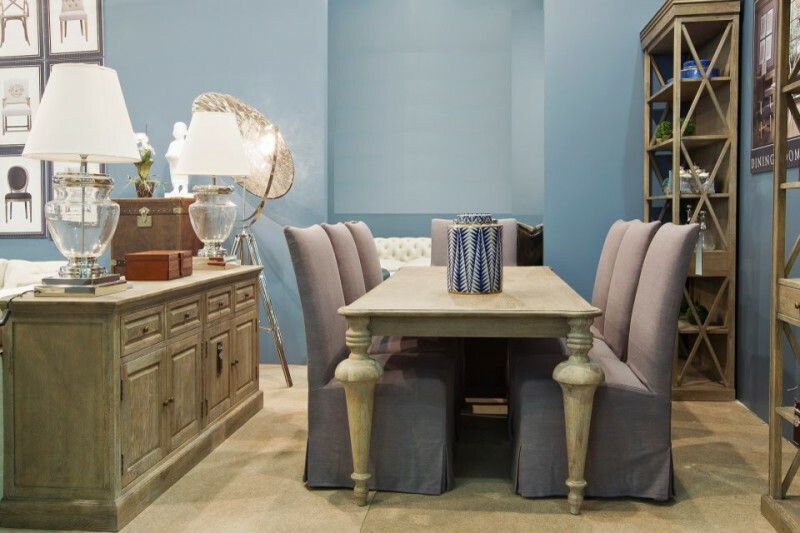 A set of elegant French style dining furniture with blue and linen upholsterers. The upholstery gives clean and formal look, and the white frames and structures explain how French style dominates these seats. Sophisticating country French style dining set. They seem so matched with country French dining room with exposed beams and other wood pieces. Here, you’ll feel a fresh breeze and beautiful view accessed from your dining room. Rustic appeal in a French provincial dining room. Rustic is obviously discovered in table base and pendant lamp. Both present old but natural look. Shabbiness is clear exposed much on them, adding classy antique appearance in the middle of delicate French dining furniture set. This French style dining set might be better to display than to be the daily furnishing set. 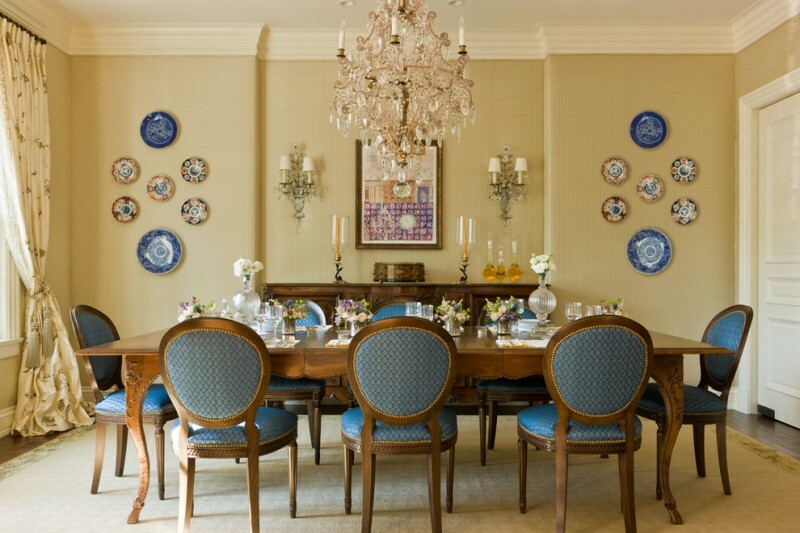 They consist of a wider wood dining table for large numbers of family and unique-look French dining chairs. Due to its size, they would be better for a larger dining room. 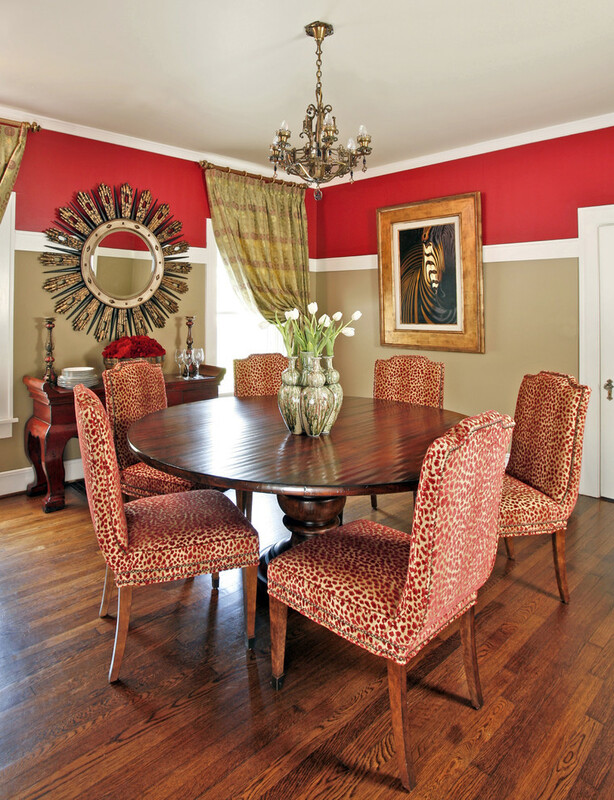 Add playful color to your wood French dining set to make your dining room much more attractive. 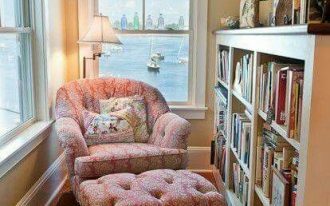 Magenta for upholstered seating and shabby green for the seats’ back are best combination to create classic but colorful furnishing pieces. Use original wood color for table as the focal point of furniture set. Classic, simple, and fully clean – the chairs are beautifully built with artistic craft details on their back and comfy upholstered seating. White round dining table adds elegance and functional item for simple dining occasions, and mini classic chandelier gives warm and luxurious look just by its gold-toned light. Never hesitate to combine French style dining set with any interior decor ideas including such modern dining room. They look brighter with their grey upholstery addition, and with low-lighted pendant lamp, they’re glowing when the night comes. Gold and white are combined to result such luxurious, expensive, and elegant furnishing pieces. The French dining set is beautified with handcrafted details and gold-toned upholstery as the comforter. Add crystal chandelier over dining table to give much more aesthetic value in room. Infuse modern appeal to your French provincial by adding metal finishing for chairs and solid black finishing for dining table. 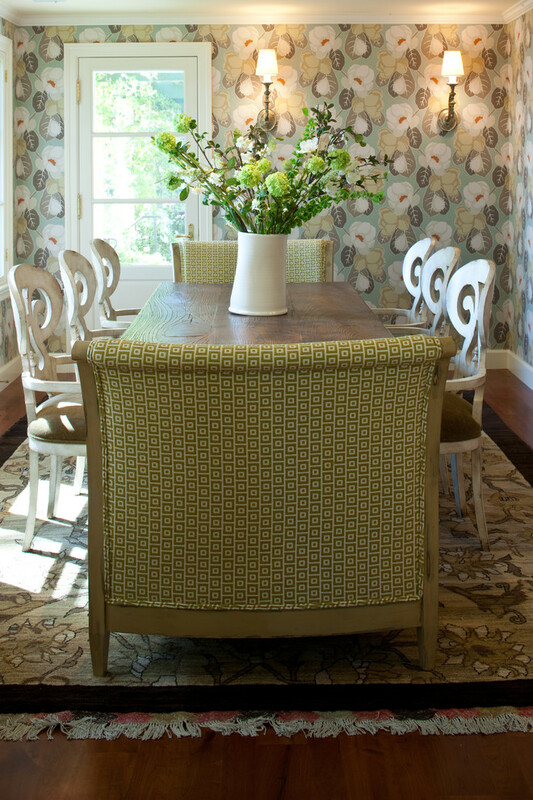 Flower motifs put on the upholstered seating successfully give something natural. 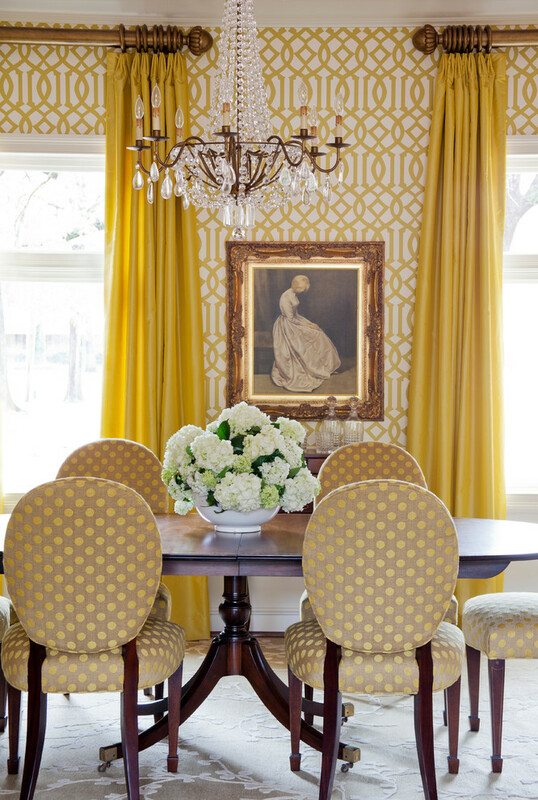 Fill your dining room with such a fresh and delight color tone like yellow. It can make your room brighter, and make it softer by combining it with the natural and earthy color tones like wood color. Both can be a perfect couple. French provincial dining set with neutral color tones. This furniture set consists of round top dining table surfaced with the best quality glass. An oversized oval mirror becomes a focal point here as it takes visitors’ attention in instant. What about the chairs? The chairs are still graceful with their artistic handcraft details and classic motifs & color. How wonderful this room is. 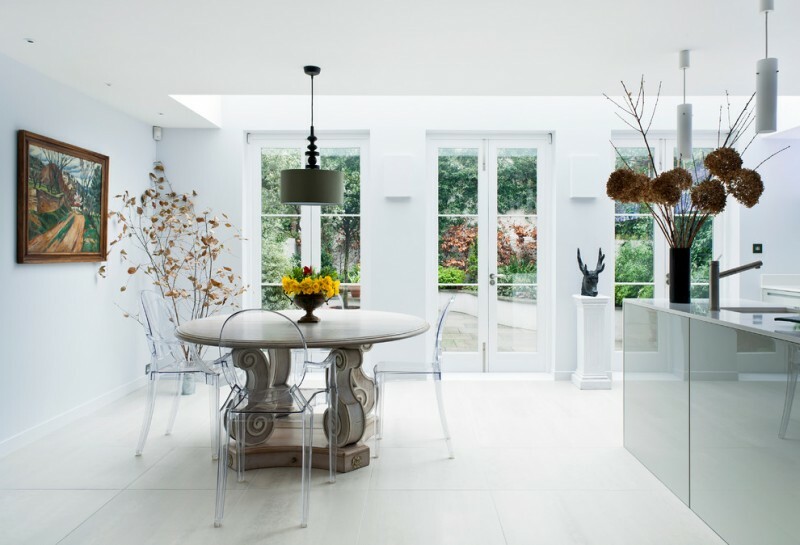 It’s a dreamy white dining room completed with single French dining chair and some industrial style dining chairs. The chairs represent two different styles: rustic and traditional (in this case is French style), and both can balance one another. 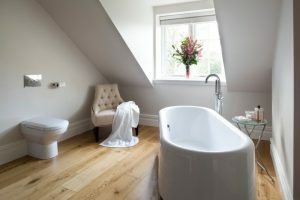 White is still dominant here and wood scheme (the floors) here is the adorable choice for giving warm and natural tones to this room. Just place your French provincial dining set as simple as it is. Complete it with simple vivid red roses on glass vase placed in the center of your round top wood dining table. It surely will give the simply beauty. French provincial dining set can be one of the best options of formal dining furniture sets. The dark wood details which are paired with white upholstery create such a beautiful contrast. 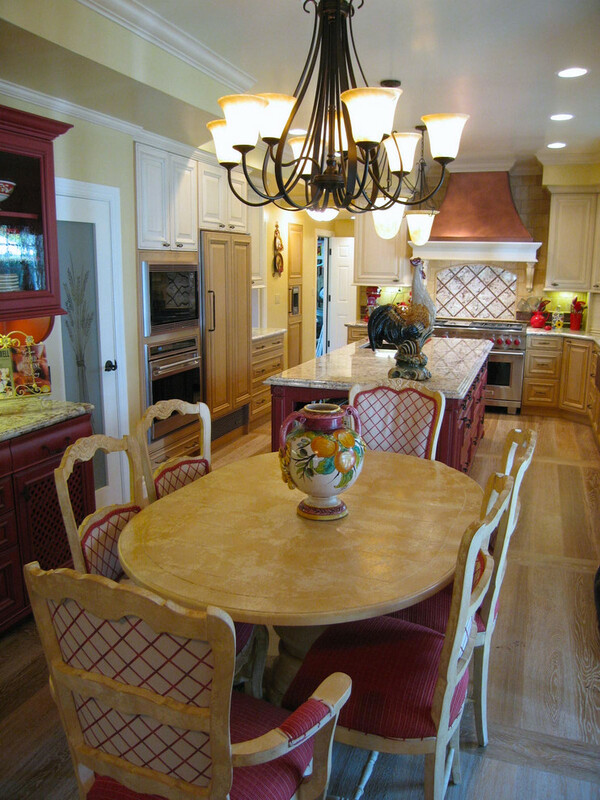 French dining set has completed another French style chandelier in which both are able to catch people’s interest. They have different color schemes but complete each other. 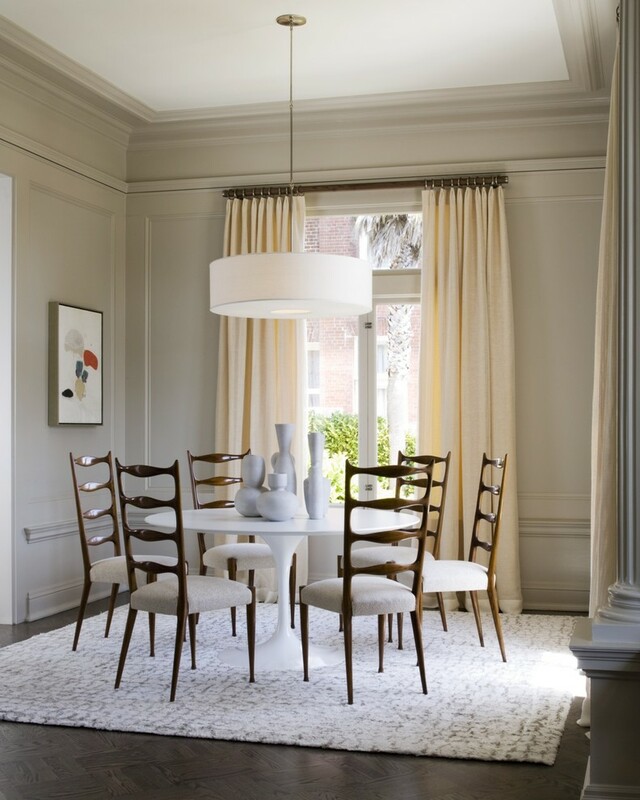 You can set them as the most inviting spot for having meals by involving neutral but soft color schemes. French provincial dining set is well recommended for a formal dining room where your guests can enjoy the fine dinner here. 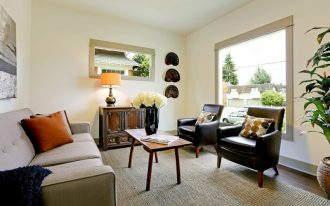 Add a couple of white chair slipcovers for creating simple elegance in this room. Gold-toned chandelier also seems to be a perfect accessory as well as a romantic light fixture. 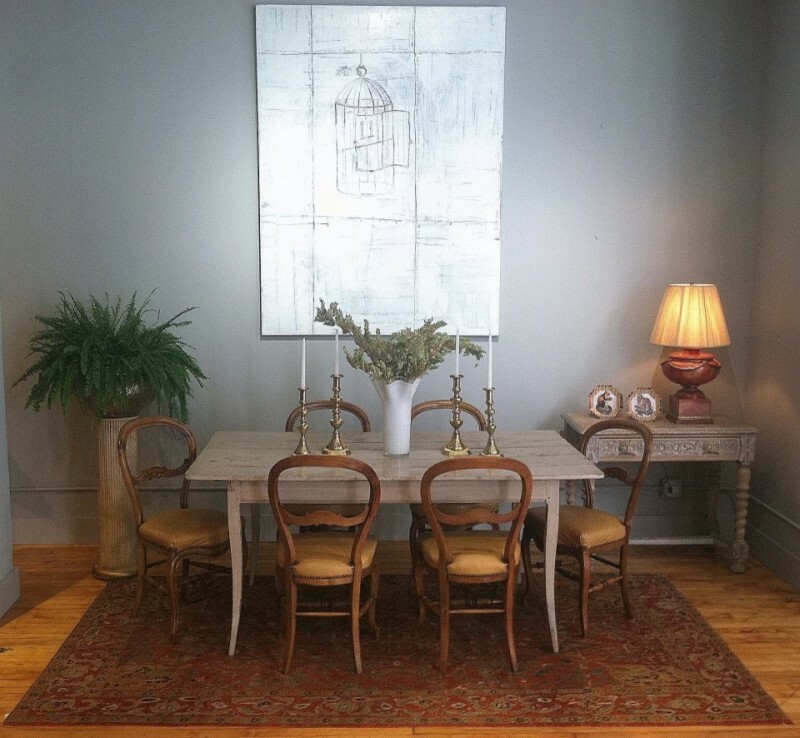 Create your own eclectic dining room just by adding soft grey French dining set plus its special chandelier. Use gold scheme to add extra elegance in your dining room. You can put it on your chandelier and chairs’ frames. 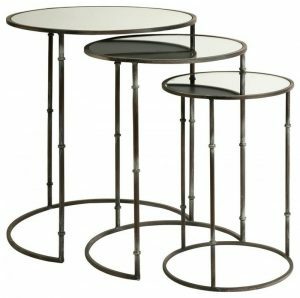 A pair of copper candle holders seems to be a great idea to create a luxurious and formal eating area. 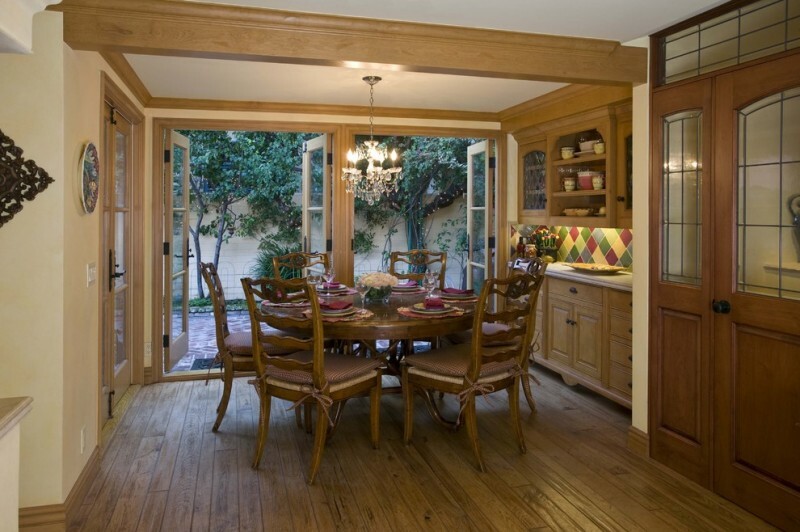 A spacious eating area with long wood dining table and several units of French dining chairs. 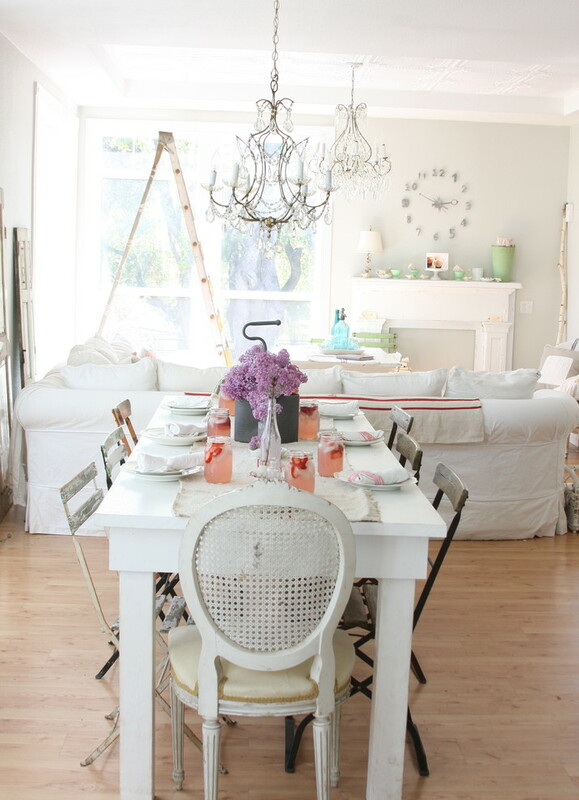 It’s perfect for shabby & chic dining room lovers. Here, the designer uses wood as the dominant material for floors and end table, but different in finishing. With these wood-made properties, the room feels warmer and closer to the nature. Create fun but formal dining room just by setting a package of French style dining furniture. 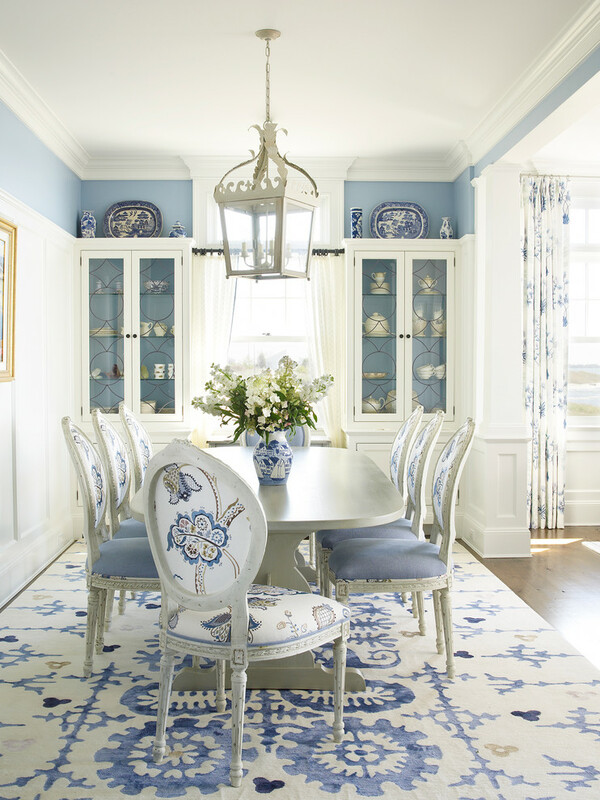 Use playful color like blue on linen inserted in chairs and makes it beautifully contrasting by featuring it with original dark hardwood table. You can add expensive and luxurious crystal chandelier for resulting warm and dramatic lights. Beige walls are perfect choice to deserve such illumination. It’s easy to turn eating into fascinating dinner experience. 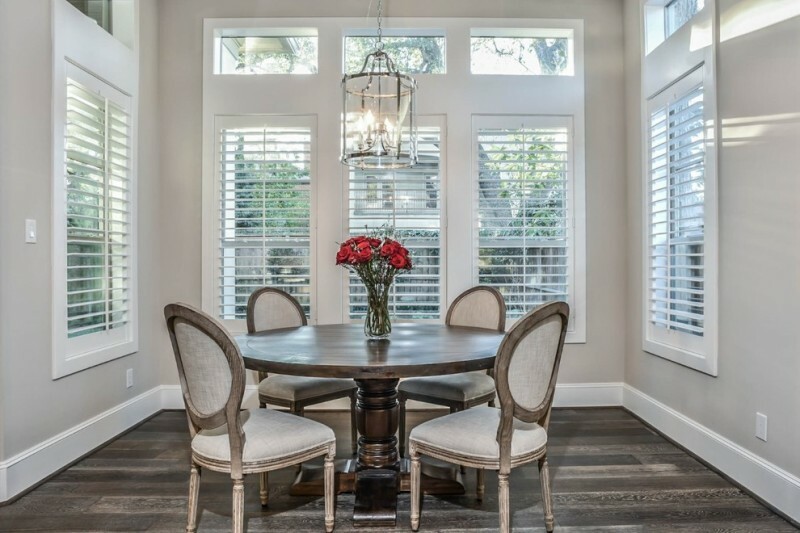 You can keep your dining room shines all day just with using the reflective accents. 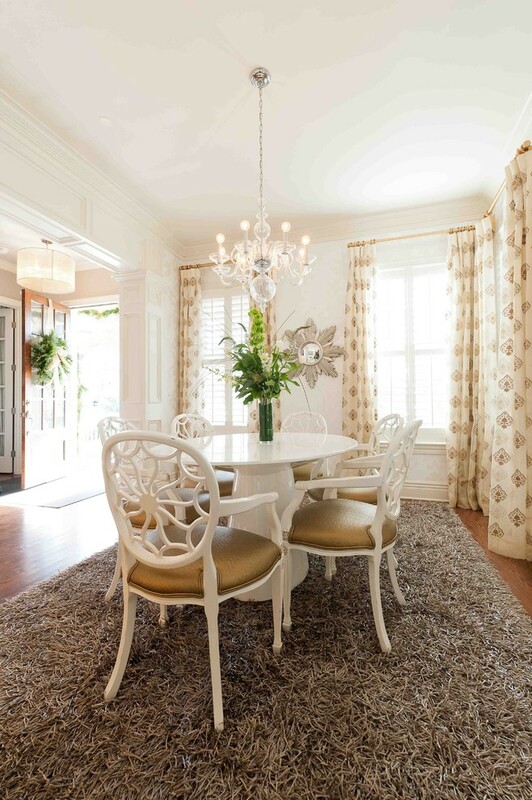 Use a classic dining table and glowing silver French dining chairs to get elegant & semi-formal look. 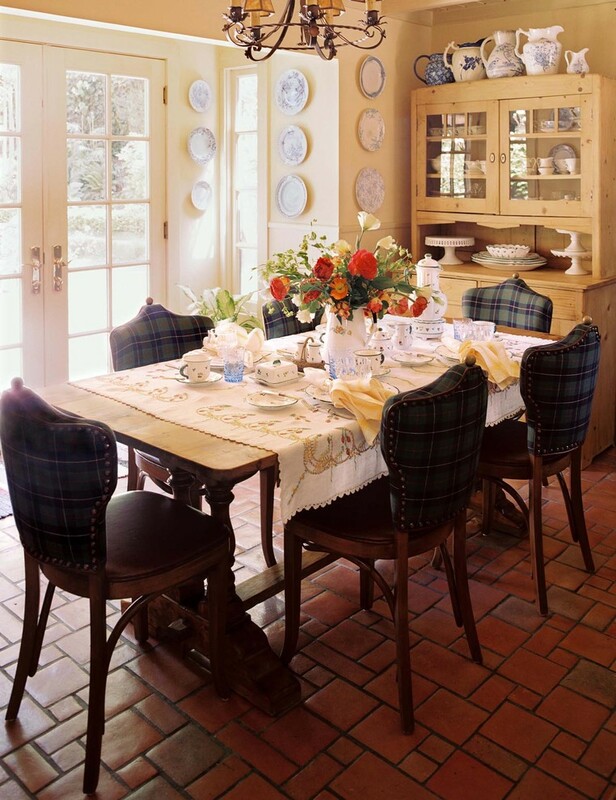 A pretty dining nook with French style dining set gives a country touch. The baroque-style chandelier also strengthens French country feel. It becomes much more inviting with a double French door that leads out into the deck and backyard. Make the outdoor becomes the main focus of indoor like this idea. It’s easy to make it real. 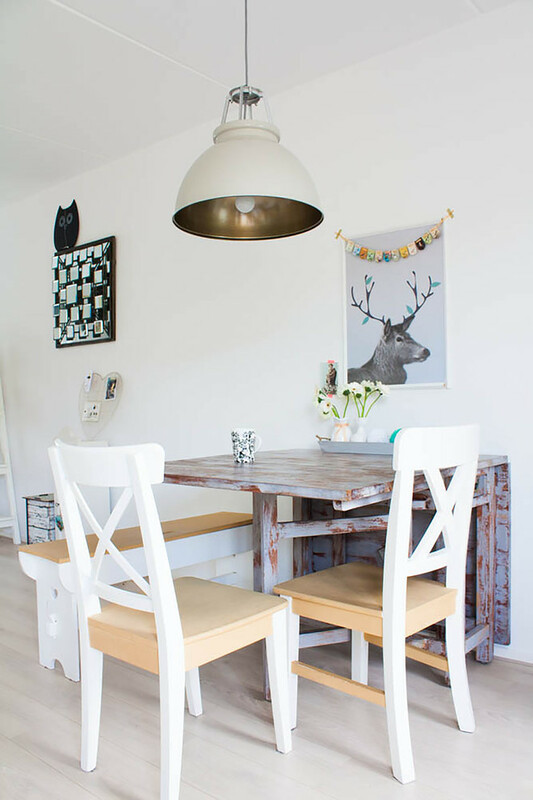 Use all-white interior items including the dining set. 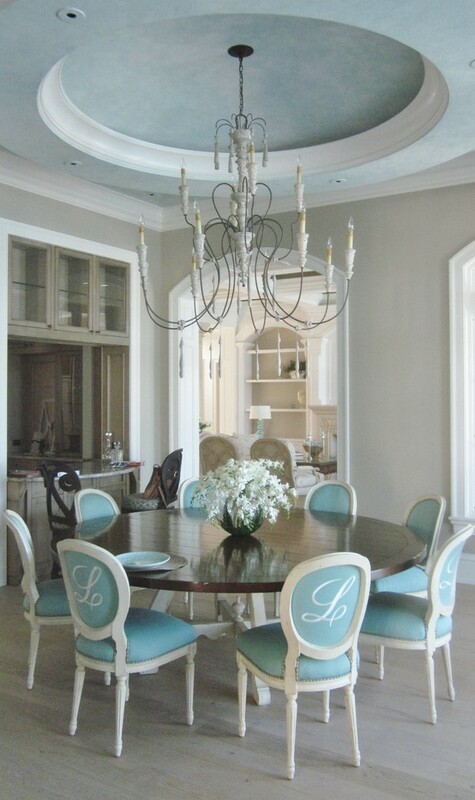 Clear acrylic French style dining chairs always enhance the framed view. Add a little bit colored ornaments to give attractive schemes in the space. Not only the chairs, the folding dining table is also attractive. It’s shabby but cool. It can also save the space, matching for a small size dining room. The chairs, in addition, are unfamiliar with French style, but they still show French appeal by their design. 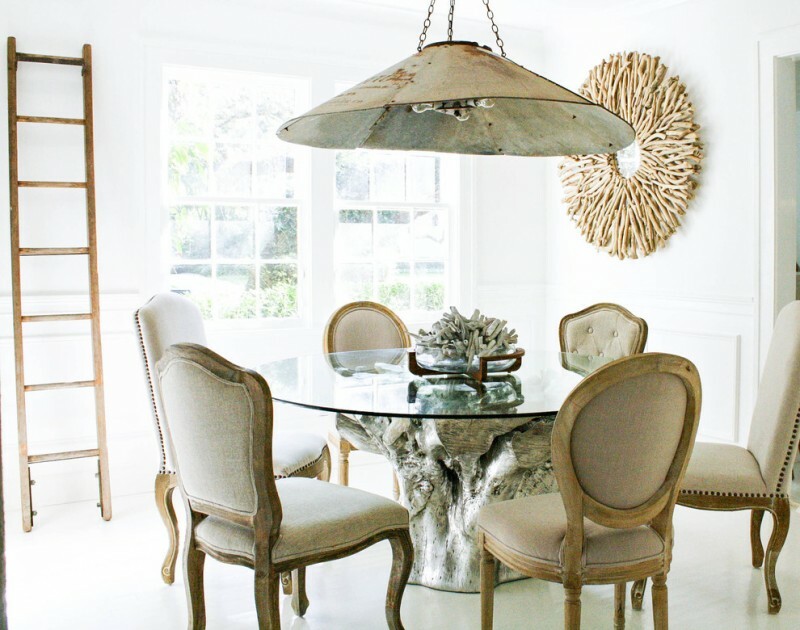 Make your French dining set as the center point of room. 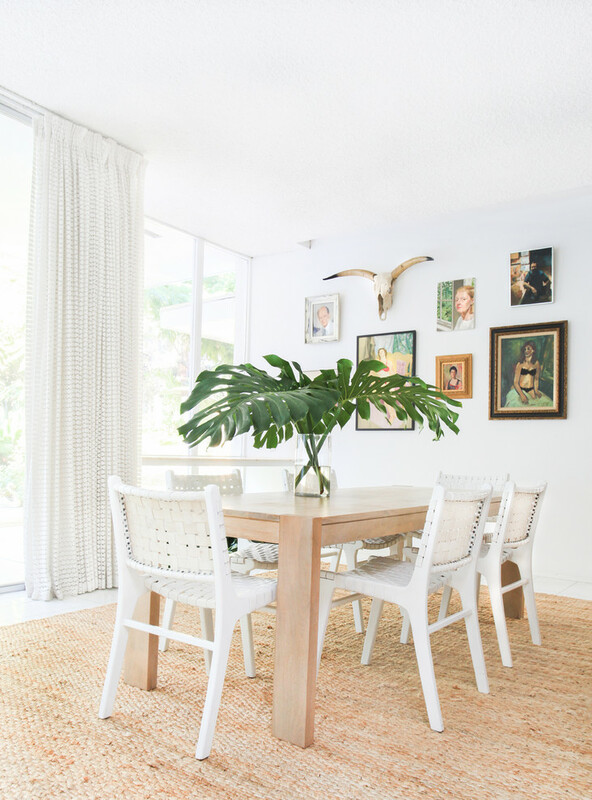 White round area rug gives the clear border where the dining nook is. Dark hardwood floors here become a contrasting base for the whole interior pieces dominated by soft & neutral-schemed ones. Looking for a classic dining set for your dining room? French style dining furniture set always be the best option. As the neutral scheme, grey always matches with any color schemes. Wood color discovered on floors and tables, and blue on walls are the two real proofs that a grey can fit for both natural and pop color kinds. Now we have a set of stunning French style dining furniture that seems to suit a classic or traditional dining room. Both lightly paint or natural wood finishing are perfect choices to give shabby & dramatic look. It’s simply white that’s able to create much of elegance. This dining set is built by custom. The chairs are supported with red cheery and French lattice linens, and the table has faux finishing and extra leaves that accommodate a larger number of crowds. The dining table is so lovely. It’s perfect and makes us feel so homey. 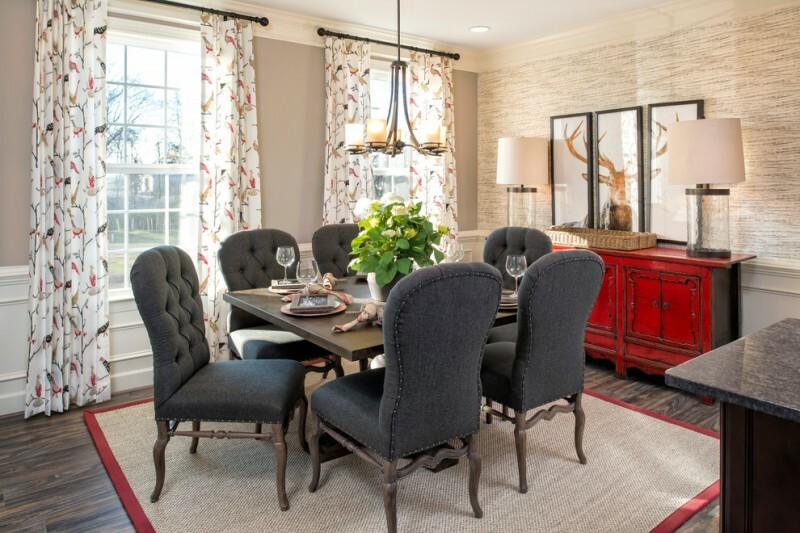 With red-patterned French chairs, the table is perfect for the space isn’t large. And you’ll find the repeated themes used in this room like circular shape for table and decorative mirror over buffet, and darker finishing applied on floors and table. 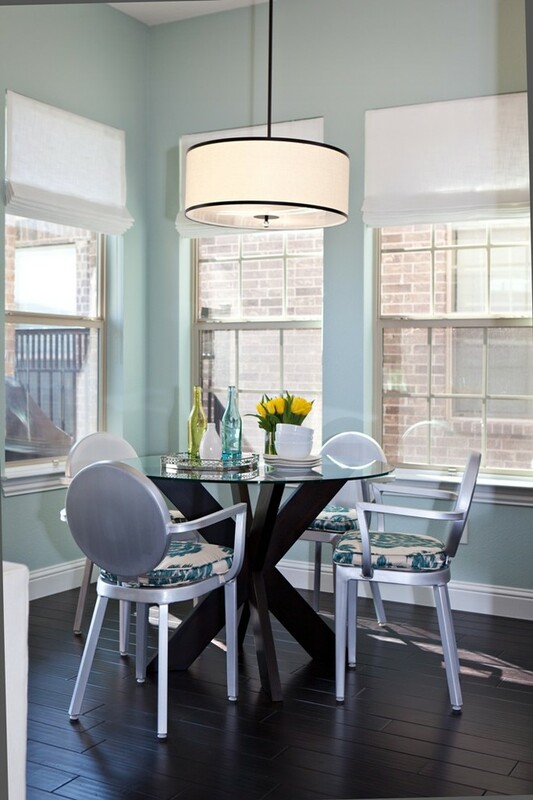 A dark finished table with walnut round-shaped top and white base is paired with French dining chairs with aqua sunbrella covers. 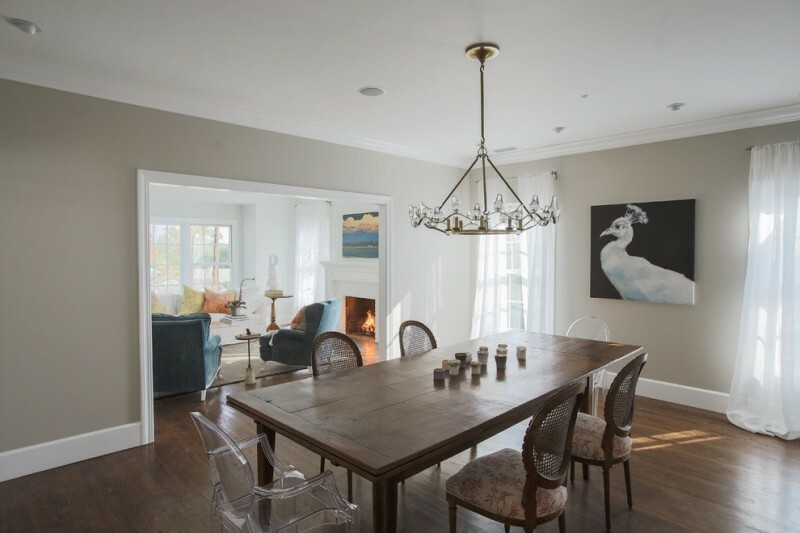 On top, a large chandelier is gracefully hung over the furniture set, giving a classic look. I think the decorative plant is too much. It’s a bit annoying, but if you love something green, fresh, and vivid ornament for your dining table, just put a simply but stunning one. Make sure that your choice keep beautifying, not annoying. 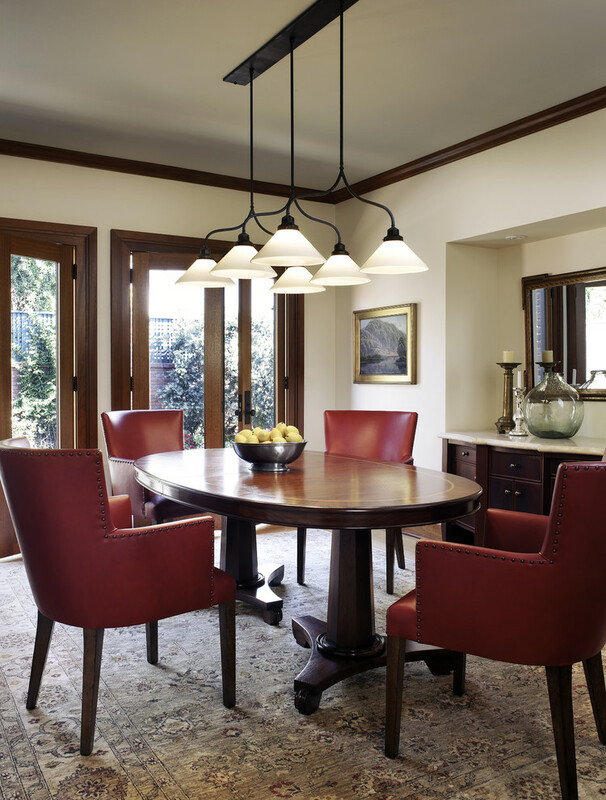 Here, the homeowner starts with a long wood dining table which is surrounded by leather-covered French chairs. And, the gallery brings something playful and aesthetic. The fabric is sweet. With wood frames, the fabric looks visually soft and warm, exposing more its feminine appeal. Soft & pale tone table seems to be perfect complementary dining furniture that always be most attractive piece after the chairs surround. 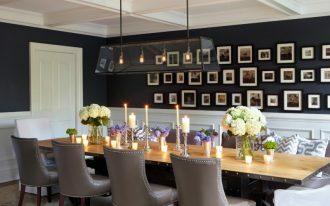 Elegant and comfortable eating area – The French provincial dining chairs are surrounded by seating benches and dark-finished wood table. The color combination is really perfect and works well with the lighting and chalkboard on walls. 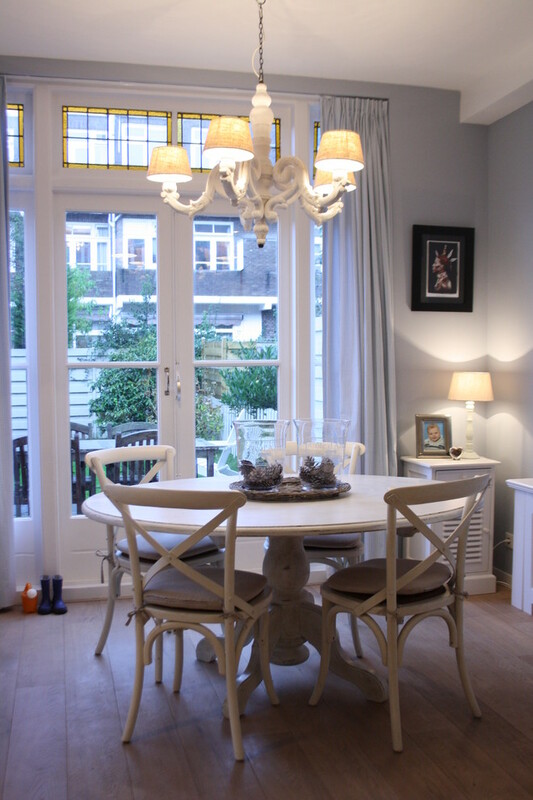 Clear acrylic dining chairs look so stunning yet contrasting to old & shabby dining set. 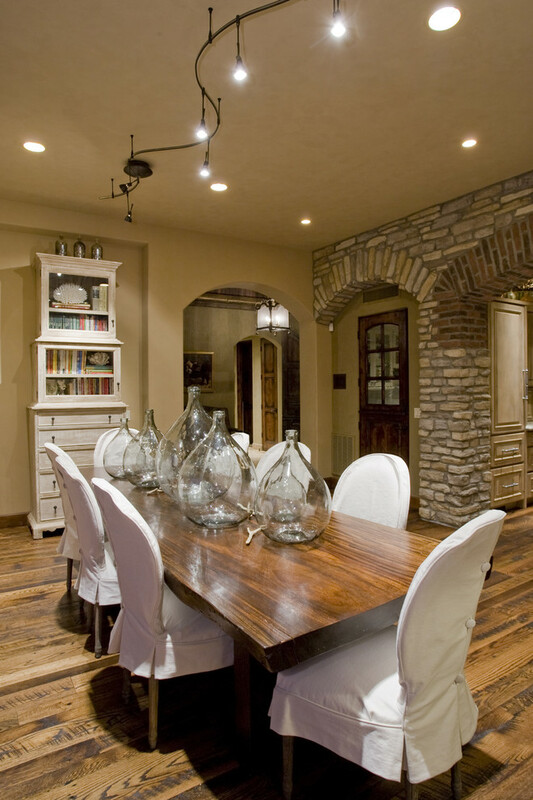 They are intentionally designed to give modern touches in such traditional dining nook. 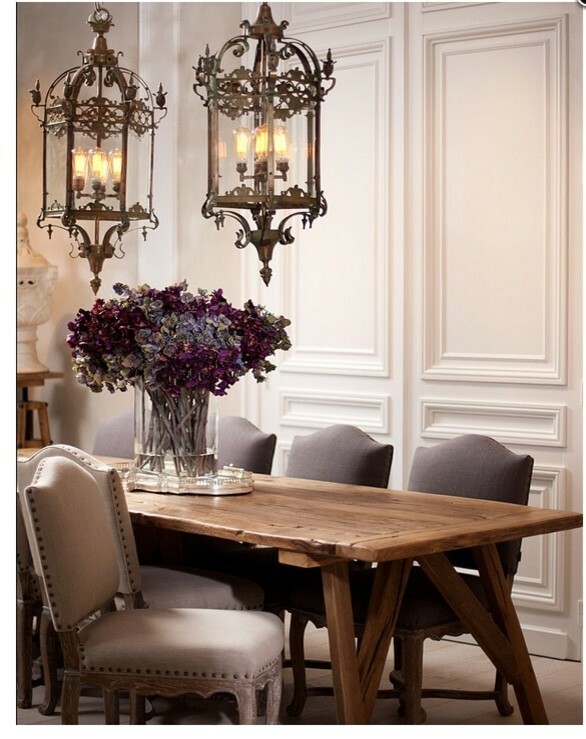 The chandelier, in addition, adds dramatic but elegant look in the middle of shabby dining area. 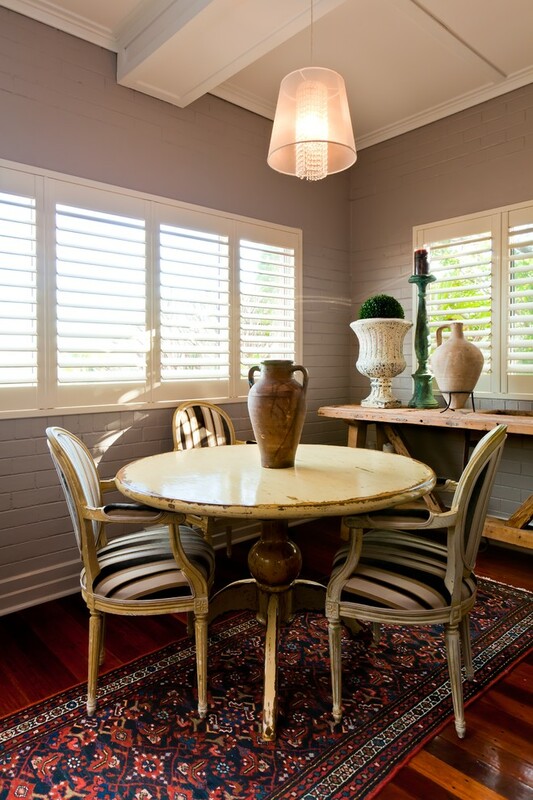 A good proportion and interesting dining set works perfectly for a small dining area. The runner is much better than square area rug. Why? It can create an elongated visual effect. It’s good idea to you whose matter of limited space. 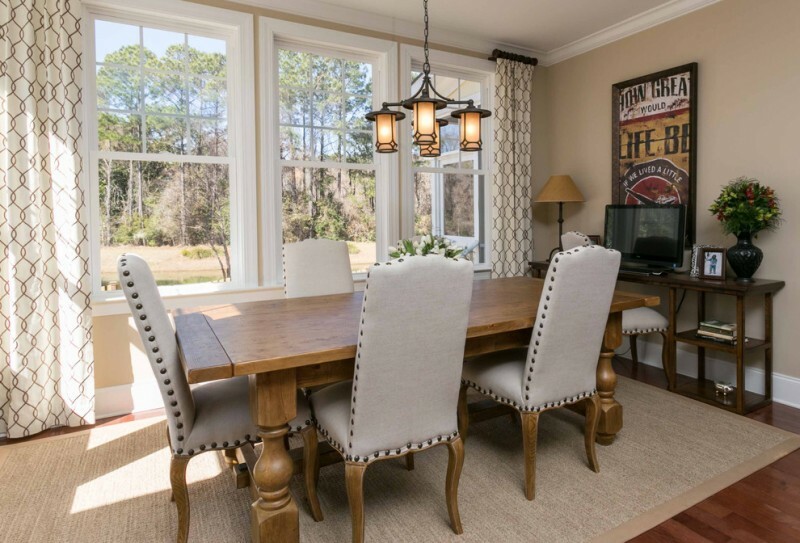 This is an inspiration of craftsman dining area furnished with elegant grey French dining chairs and long wood dining table. The rug is similar to chairs’ color that’s clearly contrasting to the floors. Such difference evidently gives the color richness. The pendant lamp, additionally, creates warm feel as well as classic look in this room. 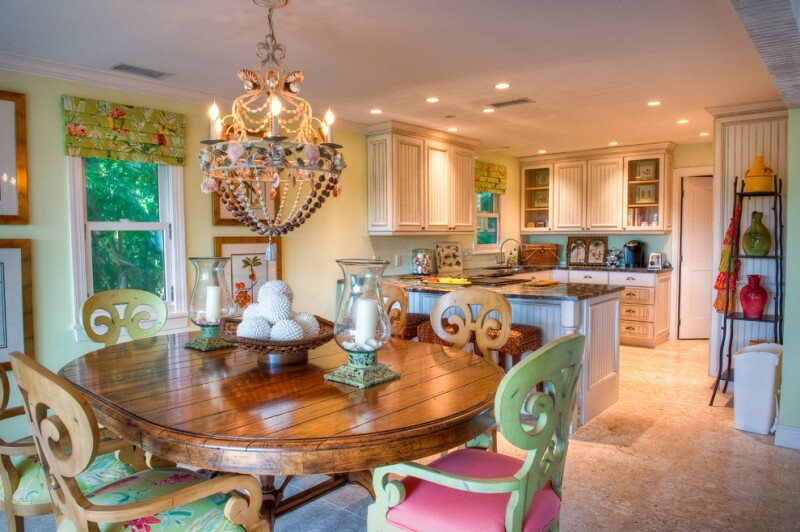 An inspiration of eclectic eating area with a stunning French dining set. The chairs are so unique. They have balloon-look-like back with rare horizontal stick. The table, on the other hands, has brighter finishing as same as the side table’s. This color is interesting and be a good match for the grey walls and wood floors. 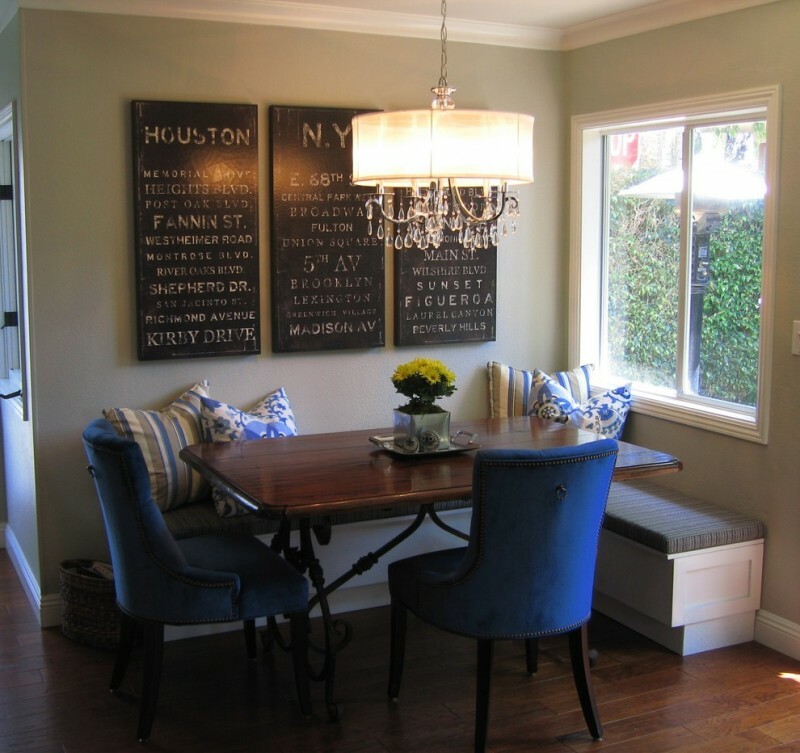 Good idea to use a banquette against the half-installed wall. It will be a functional spot to take a seat or just a partition that allows us to see the next room. Yellow and dark brown are chosen for French dining set to create clean lines and contrast as well suggested for a contemporary dining room. Let’s play with red color. Here, the red is used as the chairs finishing. The finishing itself is best quality red leather and it’s applied on a set of French chairs. The chairs’ base is black that gives a bold and contrasting look for the chairs. The similar color is also covering the oval table, providing a different but harmonious feel for both chairs and table. And, the chandelier has a simply design but still charming with its gold glows of light. The chairs’ back is unique. It exposes wood stretchers to make the user comforter when leaning on it. The chairs are also completed with foam covered with white fabric. 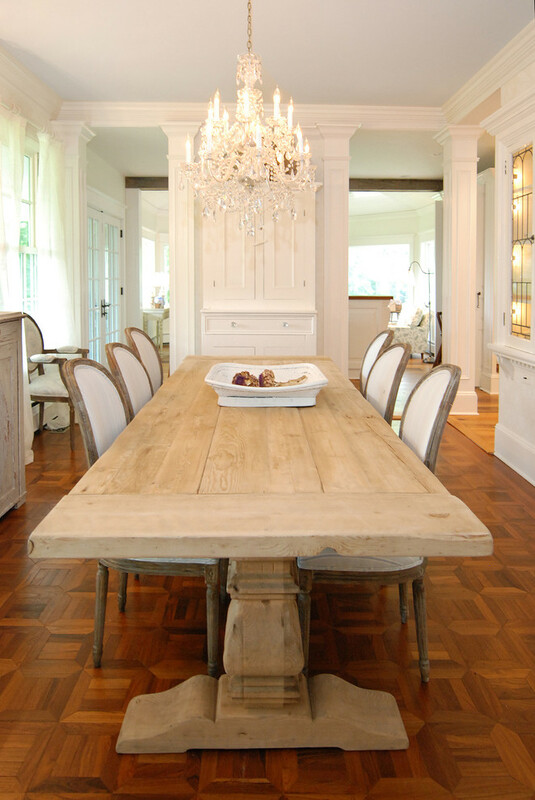 White round top table absolutely becomes a perfect match for the chairs. 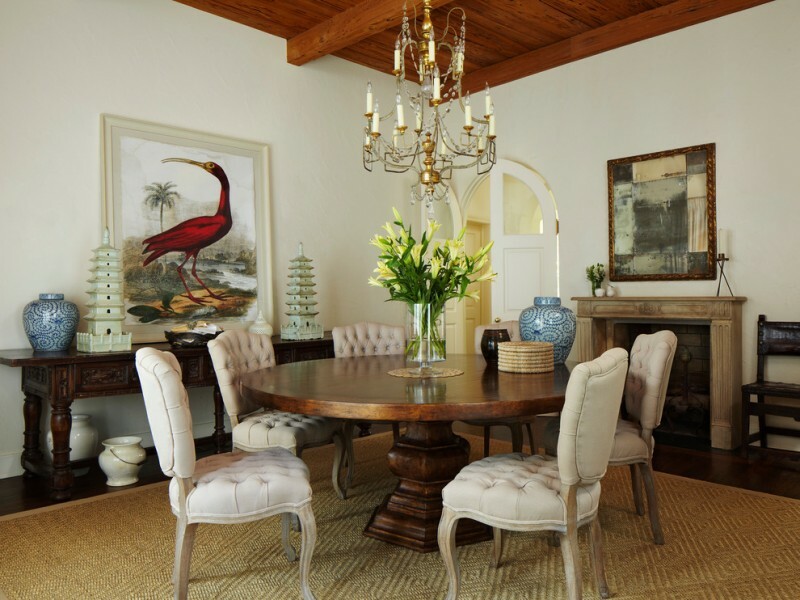 A fancy dining nook in traditional style – a great choice for a fine dining moments or special family parties. Every single furniture piece has highly aesthetic in design and color. They look much brighter with green and candle arrangements set on the table. This dining set consists of French provincial chairs with rounded back plus short white slipcover. This appearance is simple but elegant. This idea is brilliant to try when you want to change your dining set without changing the furniture. It must be more enjoying to have your breakfast in such dining room. Scottish feel is deeply applied in this room. Uniquely, French chairs are found here. With striped fabric for the back and leather finishing for seat, the chairs offer a pleasant spots for dinner or breakfast. 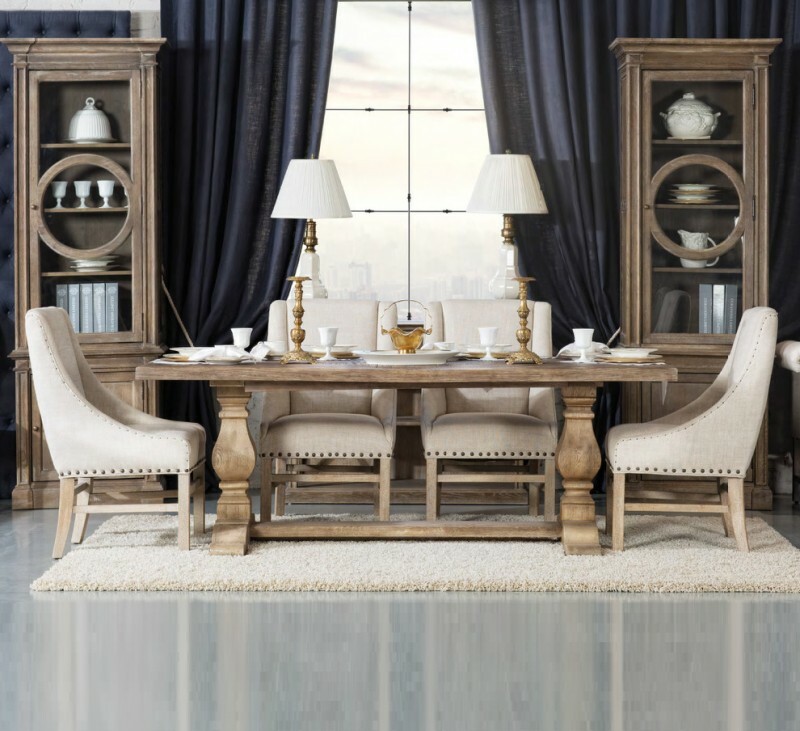 Pure French country dining set idea – The furniture shows how elegant it is. Every single part of design expresses highly level of designer’s skill in forming such perfect product. Grey is chosen to represent soft & neutral scheme, and the designer covers the chairs with grey slipcovers to add elegant look. Just base and arm-holders of chairs are left in original wood. Lovely chairs and table. They are the real representation of French provincial dining set that exposes the genuine idea of French style. Just add decorative porcelain serve-ware on the table for beautifying the furniture. Grey always be the most favorite color of French style dining chairs and long wood table becomes the best match for the chairs. 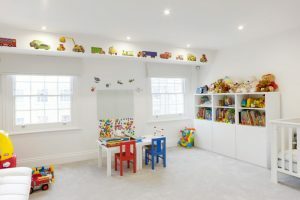 To make it more playful, add little beautifier set on the table, or add unique pendant lamps as the accessories as well as the functional lighting fixture. Choose bright red console table for completing your French style dining set. It surely brings distinctive color in this room. Let’s take a look at the walls and draperies; they have different types of color application, both work optimally even they’re applied side by side. 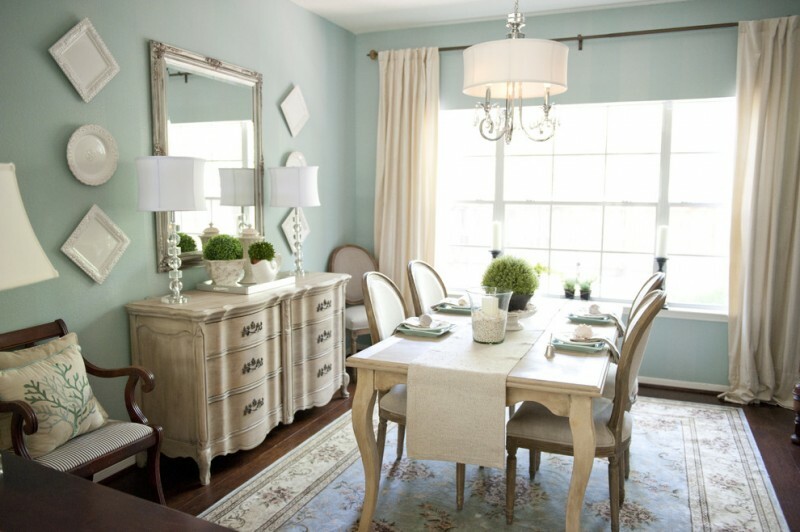 This is a simple way to do a French style dining room. We not merely need a set of French style dining furniture, but we also need supporting pieces to make our dream comes true. A traditional chandelier and a console are just few samples that evidently give the dreamy French style. 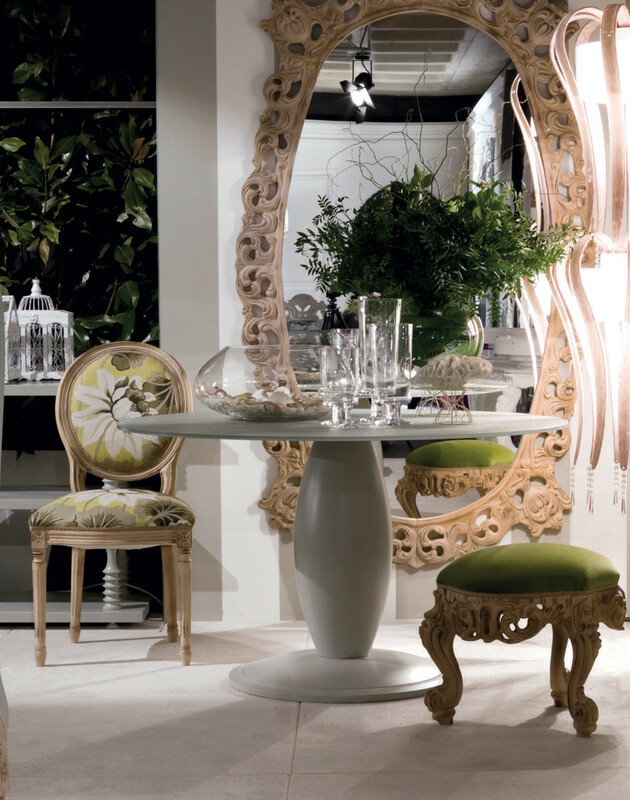 The dining set is so elegant with light green fabrics and wood frames. The design is full of artistic curve details, performing the real art of craftsmanship. 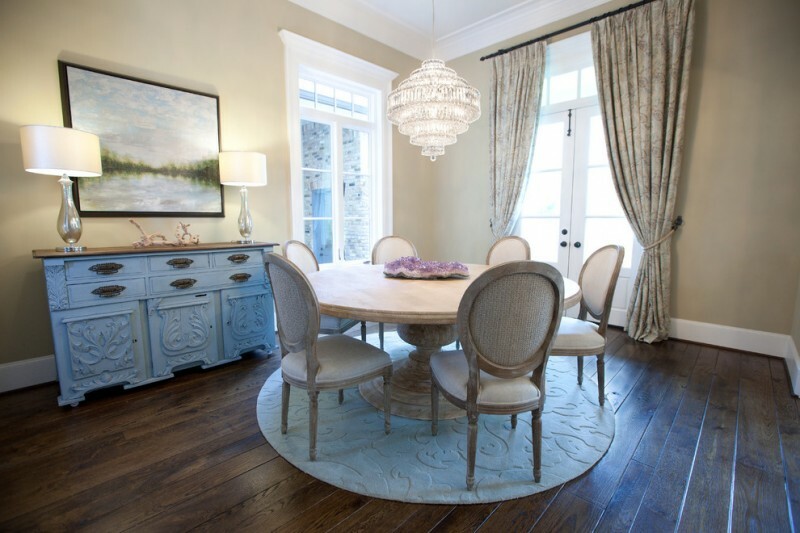 Large round top dining table obviously complements the chairs. Its dark finishing performs a contrast to all multicolored items surround.